President Donald Trump’s first week was a bumpy ride of executive orders, with the commander-in-chief and his team occasionally dumping oil on hard-won gains under the Obama administration with groups firing back with protests. Just moments after being sworn in at his rainy inauguration ceremony, Trump issued his first executive order, directing the government to freeze regulations associated with the Affordable Care Act. The key term to note is “maximum extent permitted by law,” which means the executive order neither countermands any portions of the historic statute nor reforms any of the regulations duly promoted by the Obama administration’s Department of Health and Human Services (HHS) and other agencies. “Akin to a political scream, but a policy whisper,” tweeted one health care reporter, Vox’s Sarah Kliff. Similarly, Trump’s executive orders to revive the controversial Dakota Access and Keystone XL oil pipelines looked like another effort to dismantle former President Barack Obama’s environmental legacy. What he signed was an executive order to expedite environmental reviews involving the State Department on the Keystone XL oil pipeline and whether to withdraw the federal notice to prepare an Environmental Impact Statement over the Dakota Access Pipeline. Trump said both pipeline projects would be subject to renegotiation. He has also insisted that all new projects make use of American steel, although that provision was not included in the executive order. 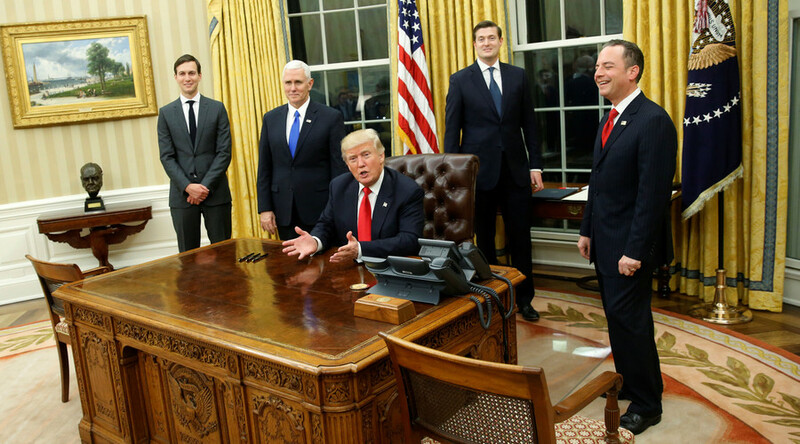 On Monday, Trump formally withdrew the US from the 12-nation Trans-Pacific Partnership (TPP). The highly secretive trade deal was also passionately opposed by liberal Americans concerned about threats to net neutrality and environmental protections. “I will build a wall,” Trump repeatedly said throughout his presidential campaign; on Wednesday, he signed two executive orders concerning immigration and border security. He ordered the building of a multi-billion dollar wall along the nearly 2,000-mile US-Mexico border, and signaled tough action against the 11 million reported undocumented immigrants in the US, most of whom are Latinos. He also ordered the hiring of 5,000 more immigration agents, and forced out recently hired Border Patrol Chief Mike Morgan, an FBI veteran. On Thursday, Mexican President Enrique Pena Nieto canceled his planned trip to meet Trump in Washington later this month in the face of demands from the US president that Mexico pay for the border wall. The White House on Thursday compounded the tense US-Mexican relations by saying the administration is considering paying for the wall with a 20 percent import tax on Mexican products. If put into effect, US consumers would thus pay for the wall, and it could lead to a trade war with one of the United States’ biggest economic partners. Republicans often cite the case of voter fraud to support legislation creating voter ID rules that unfairly target minorities and the poor. Taking up the mantle of voter fraud, Trump claimed this week there was voter fraud during the 2016 election, claiming 3 to 5 million illegal voters ensured he didn’t win the popular vote. So far there is no evidence of significant voter fraud. Trump based his notion on a third-party story told to him by a professional German golfer in which a voter was alarmed by lines of people “who looked like they shouldn’t be allowed to vote” being able to vote, the New York Times reported. Following the protests during Trump’s inauguration, and the impressive response to the Women’s March worldwide on Saturday, dissent protests continued throughout the week. The protests became symbolic and visual when Greenpeace activists scaled a construction crane and dropped a 35ft by 75ft banner emblazoned with the words RESIST in huge black writing that could be from the White House lawn for 12 hours. Protesters were arrested and face charges of burglary and property damage. As of Thursday, the Trump administration had signed 13 executive actions. Others dealt with cutting regulations on US manufacturing, a freeze on hiring new government employees and other issues. More are in the works. The most widely anticipated are new orders on national security, refugees and visa rules. According to one draft order, Trump is expected to block refugees coming from war-torn Syria and to suspend the entry of any immigrants from seven mostly-Muslim countries: Syria, Sudan, Somalia, Iraq, Iran, Libya and Yemen. Word of that order and threats to cut federal funding to cities that are known as “sanctuary cities” was enough to get thousands of New Yorkers out protesting at Washington Square Park on Wednesday night, with a protest of solidarity in Washington, DC. In response to Trump’s hiring freeze order and communications black out, some official social media accounts tweeted out messages decidedly at odds with his administration’s agenda, and others leaked documents to press outlets. The Defense Department used Twitter on Wednesday to publicize an article about an Iraqi refugee who became a US Marine. “From refugee to #Marine. #USMC Cpl Ali J. Mohammed takes the fight to the doorstep of those who cast his family out,” the department tweeted of his fight in Iraq. One of the first bureaucracies to enter the standoff with Trump was the Office of Government Ethics, which resolves executive branch employees to resolve conflicts of interest before taking their posts. Director Walter Shaub challenged Trump’s online persona in series of nine bravado-inflected tweets calling for the president to sell off his financial holdings, which the president has said he will do; Trump does not appear to have done so yet. Other resistance came from agencies concerned about environmental and scientific research. On Tuesday, South Dakota’s Badlands National Park tweeted: “Today, the amount of carbon dioxide in the atmosphere is higher than at any time in the last 650,000 years.” The message, along with two others, were deleted only to reappear thanks to rogue government Twitter handles. The Senate confirmed Trump’s pick for US ambassador to the United Nations, South Carolina Governor Nikki Haley. They confirmed Ben Carson to lead the Department of Housing and Urban Development, and gave voice votes for his commerce secretary, conservative billionaire Wilbur Ross and Transportation Secretary Elaine Chao. Chao is the wife of Senate Majority Leader Mitch McConnell of Kentucky. A Senate vote is expected soon on Trump’s choice for secretary of state, former ExxonMobil CEO Rex Tillerson. Senator Dianne Feinstein (D-California) forced a one-week delay on the committee’s vote on Trump’s attorney general nominee, Senator Jeff Sessions (R-Alabama). She said senators “owe it” to more than 1 million women who marched in Washington and other locations to be careful in considering Sessions’ nomination and his willingness to protect equal rights. On top of that, the committee received 188 pages of new material they need to review. Deliberations over two of Trump’s picks turned testy as both nominees faced questions from Democrats over finances. The minority party peppered Representative Tom Price (R-Georgia), the president’s choice for HHS, over his decision to invest in health care companies. Trump’s budget director choice, Rep. Mick Mulvaney (R-South Carolina), is also raising the hackles of Democrats, who discovered he failed to pay more than $15,000 in payroll taxes for a babysitter more than a decade ago. He has since paid the taxes and said he discovered the omission when preparing for his nomination process. Trump’s pick for education secretary, Betsy DeVos, is also under scrutiny for her qualifications, political donations and advocacy of charter schools. While the number of Trump appointees is a mere trickle, the number of senior career foreign service officials resigning at the State Department was more of a waterfall, with a total of six resigning by Friday. The White House vowed on Sunday to fight the news media “tooth and nail” over what it claims is unfair attacks on the Trump administration. It began with media reports on the low inauguration crowd estimates compared to Obama’s first inauguration, and to the huge numbers that turned out the following day for the Women’s March. "The point is not the crowd size. The point is the attacks and the attempt to delegitimize this president in one day. And we're not going to sit around and take it," White House chief of staff Reince Priebus said on "Fox News Sunday." The sparring with the media dominated Trump's first week in office, eclipsing debate over policy and Cabinet appointments. But as Dilbert’s Scott Adams wrote in his blog, Trump sure got a lot done. “At the moment, there are so many outrages, executive orders, protests and controversies that none of them can get enough oxygen in our brains. I can’t obsess about problem X because the rest of the alphabet is coming at me at the same time,” wrote Adams.